In 1976, George Cohon, an American transplant to Canada, ran into a Soviet delegation to the Montreal Olympics. This was perfect networking for the chairman of McDonald's Canada, who had an idea to bring the famous fries to the Soviet Union at the height of the Cold War. 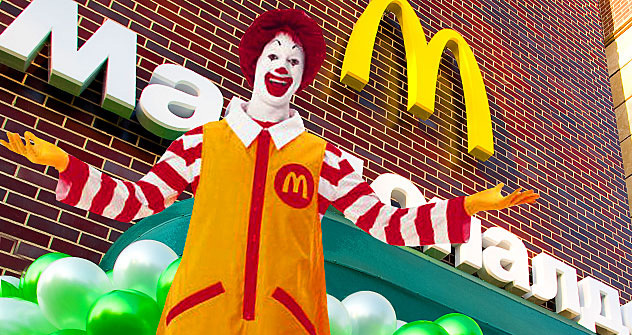 He didn’t anticipate it would take him 14 years of cajoling a skeptical Communist bureaucracy to open one McDonald’s. When his first restaurant opened on Pushkin Square in the heart of Moscow in 1990, more than 30,000 people showed up on the first day, clamoring for a taste of capitalism, and they had to be held back with police barricades. Years later, some Muscovites still recall the event fondly. Russians have a habit of saying they hate McDonald’s, but just try getting in line on a Sunday afternoon. From the beginning, Cohon had the instinct to make it a people’s burger joint, triggering his own Russian revolution in service, cleanliness and, more controversially, fast-food. "There were these restaurants back then that had long lines for customers with rubles and practically no lines for people with [dollars]," the 73-year-old Cohon recalled recently over lunch at the glitzy Ararat Park Hyatt hotel in Moscow. "We didn't do it that way. We put the 'rubles only' sign outside together with [then-Moscow Mayor Yuri] Luzhkov to emphasize the point." Cohon now has 280 restaurants in Russia and 25,000 employees. And he notes proudly that 80 percent of what he sells is domestically produced, an inconceivable statistic in Soviet times. "We even export the odd pie to Germany," he said. Cohon’s son, Craig, worked as a top executive for Coca-Cola during its introduction to the newly opened markets of Eastern Europe in the 1990s. The two have more recently moved from fast food to big-stakes entertainment. Their newest deal, the $57-million Cirque du Soleil show Zarkana, is an ambitious production scored by none other than Elton John. "It took 14 years to bring McDonald's to Russia, four years to set up Coca-Cola distribution and production, and eight months to get Cirque de Soleil rolling," said George Cohon. "I think that's a good barometer for the ease of doing business here." The Cohons have been outspoken advocates of doing business in Russia and are dismissive of the concerns of more risk-averse entrepreneurs. "I was here when tanks shot at the White House in 1993," said Craig Cohon. "We continued business. I signed the latest deal in the Kremlin last month half an hour before the bomb went off at Domodedovo [Airport]. That's just a part of life." "I could easily picture myself as a Russian investor in the U.S. saying, 'I was here during the Oklahoma City Bombing, 9/11 and the Arizona shootings and we continued business," he continued. Craig Cohon said the key to success in Russia is three pronged: First, a commitment to the long-haul for real returns; second, cultivating personal relationships; and third, not managing from afar. "It’s a handshake market," he added. The Cohons said they have never been asked for a bribe, a common complaint of both Russian and expatriate businessmen. "It could be because we have maintained our core principles from the start," said Craig. "We’re here for the long term, we build relationships, we hire locals and we help develop other sectors like agriculture. People who complain [about corruption] could be the ones who were burned because they came for the quick buck." “McDonalds is a franchise and is essentially selling a financial and logistical model in Russia. They are also selling an established brand that has been in Russia for a very long time. I wouldn’t expect them to encounter corruption for those reasons,” said Butrin. “And there are businesses that don’t pay any bribes,” he added. George Cohon emphasized that philanthropy is another critical component if you want to be taken seriously. "You’ve got to do charity," he said. "A lot of my friends wanted to come to the opening of the first McDonald’s here. I said, 'Okay. You pay for your own airfare, hotel and meals. And then you cut me a check for $10 thousand. All that money went to the first Soviet charity for kids. Now we've got our own charity that converts unused rooms in children’s hospitals to apartments so parents can stay with their kids. It's good stuff." At the end of the 2010 Winter Games in Vancouver, Craig Cohon’s two children, 12 and 10, participated in the ceremonial handover to the Russians organizing the next Winter Games in Sochi. "I think that's the perfect archetype for the last 30 years of my life," said Craig. The Cohons’ latest project, the deal with Cirque du Soliel and the Kremlin Palace Theater, is sure to be a high-profile spectacle. The show will open at Radio City Music Hall in New York before moving to its main stage in the heart of Moscow. "We'll try it in New York, and then take it to the Kremlin," said George. They have also struck a deal to bring Cirque's main traveling show, ‘Saltimbanco,’ together with the Theater, to four major Russian cities in 2011. Cirque has invested close to $50 million in Russia since 2008, and the company’s founder spent $35 million to be a space tourist with the Russian space program. Both men say they are optimistic about Russia’s future and insist that Western critics of the country’s democratic development could be a little more patient. Said Craig: "By 2030, I see four key points of development: the middle class learning to defend its rights via the evolution of strong political parties, business moving away from raw materials and investing into manufacturing and high tech, which is already happening, culture developing with a local base as opposed to being imported from the Wes, and Russia becoming a leader in anti-terrorism efforts together with the U.S. and India." George, smiling, said he was looking forward to it all. "I'll be 93 then," he said. The average McDonald's in Russia, at 850,000 visitors, is twice as busy as any McDonald's in the United States, according to The New York Times. It all started when the restaurant came to the U.S.S.R. in 1990. George Cohon hired a young Chechen as the manager of the first Pushkin Square McDonald's. The manager position was no easy job in Moscow; 80 percent of the products had to be imported. A proprietary factory called the McComplex was built to make the 300 ingredients for each store as the chain grew. In those days, there were no private suppliers. Today, 80 percent of the products are made by local suppliers and Khamzat Khasbulatov, "the young Chechen," is the president of the entire Easter European division. The chain currently operates 280 restaurants in Russia, some in previously remote locations like Tyumen, Siberia, and continues to expand rapidly. McDonalds celebrated another milestone last year when it closed its McComplex outside Moscow upon outsourcing the last ingredient – hamburger buns – to a local company. French fries are imported due to a lack of a market for frozen potatoes – Russians still prefer to buy them fresh.